Thirty plus years ago, while I was a junior analyst with a Wall Street precious metals periodical, I learned the beauty of Point and Figure charting. It is always insightful to view price movement by itself for the purpose of removing all the “noise” of short term moves and volatility. It reveals the true trend of any market, and as you know, the trend is your friend until it ends. That may sound trivial but rings very true to market movement and pricing. I have included a continuous CME chart of spot silver on a point and figure basis. As you can see, the trend has been down with lower highs and lower lows since April of 2011; a severe, long-term down trend that erased over 71% of spot silver’s value. A double bottom in late 2015 set the stage for a new long term bullish phase. Last month, spot silver broke that down trend line beginning what we believe is a new, long-term bull market. For those of you who are new to Point and Figure charting (PnF), o’s signify declining prices while x’s indicate rising prices. July’s upside breakout is a sign of things to come in the entire precious metals complex as silver has confirmed the breakout in gold, very similar to Dow Theory that declares bullish confirmation when the Transports confirm the Industrials. 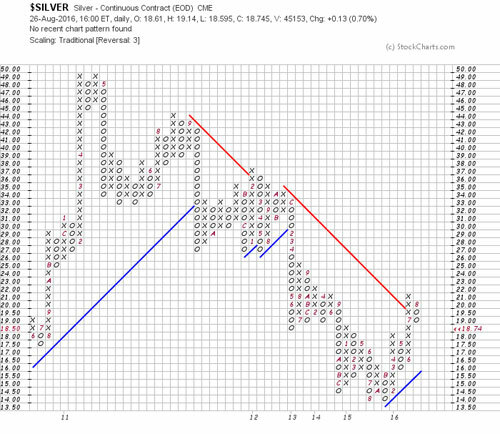 However, besides the technical PnF breakout (see chart above), there are many fundamental and geopolitical forces working overtime that should bode well for silver and gold’s 2016 up trend. Some of these forces are: over 25 current global armed conflicts, rising war tensions between the West and Russia and China, irresponsible and criminal politicians, totally out of control central bankers, radical currency devaluations, not to mention over $12 trillion in sovereign debt negative interest rates whereby governments steal your money right before your eyes. Gold and silver are great hedges against all of this chaos as well as great stores of value. There is a very strong likelihood that the present up trend in the precious metals will continue. Now is the time to take advantage of this trend reversal.